Here’s a startling truth. I can make you fat. Actually, I can make anybody fat. How? I simply prescribe insulin injections. Giving people extra insulin leads inevitably to weight gain. In type 1 diabetes, when insulin levels are extremely low, patients lose weight no matter how many calories they eat. Give insulin – gain weight. No insulin – lose weight (even to the point of death). The implication is clear. Insulin causes weight gain. Knowing this is crucial, because if insulin causes weight gain, then losing weight depends upon lowering insulin. But instead, we’ve been told to focus obsessively on calories. The standard (failed) weight loss advice is to restrict a few calories every day by reducing dietary fat and eating multiple times per day. This does not lower insulin much since dietary fat has little insulin effect and eating frequently constantly stimulates insulin secretion. This ‘caloric reduction as primary’ advice has an estimated failure rate of 99.5%. So, if you have tried calorie restriction to lose weight and failed, understand this. You were expected to fail. So here’s the situation. ‘The Man’ tells you that obesity is a caloric balance and that you should eat less and move more. ‘The Man’ tells you to eat a low fat diet, and to eat 10 times a day. This advice fails virtually everybody. When you fail, ‘The Man’ tells you it’s your own damned fault for being such a lazy assed, floppy willed person. His advice was good, ‘The Man’ tells you. You were just a failure. That’s what ‘The Man’ wants you to believe. Imagine, though we have a classroom of 100 pupils. One fails. It’s likely his fault. Maybe he played too many video games. But if 99 students fails, then it’s not a problem with the students. The problem is with the teacher. In obesity, the problem of rampant obesity means that it is very obviously not the fault of the people. The fault lies with the official dietary advice. We often think and talk about the first problem, but both are equally important in lowering insulin levels. The three different macronutrients stimulate insulin to different degrees. Carbohydrates, particularly refined carbohydrates raise insulin the most. Protein also raises insulin significantly, although blood glucose remains stable. Animal proteins stimulate more insulin release compared to plant proteins. Dietary fat raises neither glucose nor insulin. Most natural foods contain varying combinations of the three macronutrients and therefore raise insulin to varying degrees. For example, refined carbohydrate rich foods like cookies have the greatest effect on raising insulin and glucose. Fat rich foods like salmon have little effect on insulin. This differing ability to stimulate insulin means that foods also differ in their fattening effect. This is only common sense. 100 calories of cookies, is far more fattening than 100 calories of salmon, despite what all the obesity ‘experts’ claim. 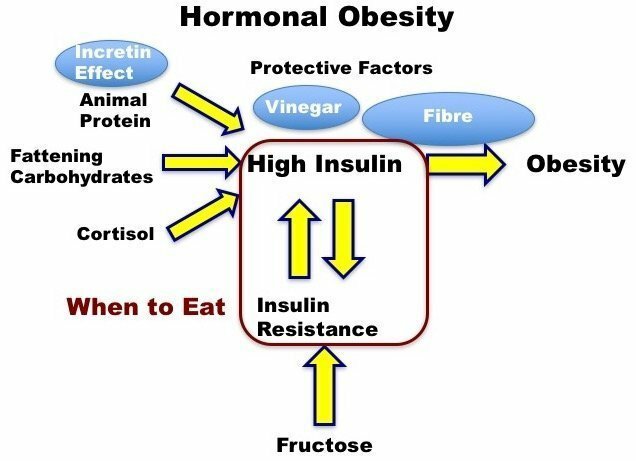 The overlap between calories and insulin effect is what causes the confusion between the hormonal (insulin) hypothesis of obesity and the caloric hypothesis of obesity. Many people say that ‘A calorie is a calorie’, which is, of course, true. But that’s not the question I asked. The question is ‘Are all calories equally fattening’? To which the answer is an emphatic no. Insulin stimulating foods like glucose are more fattening than non-insulin stimulating foods like kale, even if you have the same number of calories. Certain factors increase insulin which encourages weight gain. The most important factors raising insulin are refined carbohydrates, animal proteins, and insulin resistance. Fructose, from added sugar and fruits can directly cause fatty liver and insulin resistance. This leads the body to increase insulin secretion to compensate. Other factors decrease insulin, protecting against weight gain. Acids found in fermented foods (sauerkraut, kimchee) and vinegar lowers the insulin effect of foods. Animal protein causes secretion of incretin hormones that slows absorption of foods thus lowering insulin. Thus meat has both pro- and anti- insulin effects.Fibre also has this same effect of slowing absorption and insulin effect. Thus, the main principles for lowering insulin and losing weight would include the following, as detailed in The Obesity Code. Funny. That’s precisely the sort of no-nonsense advice your grandmother would have given. The second and equally important part of lowering insulin is understanding the question of ‘when to eat’. All foods can raise insulin, which leads to obesity. 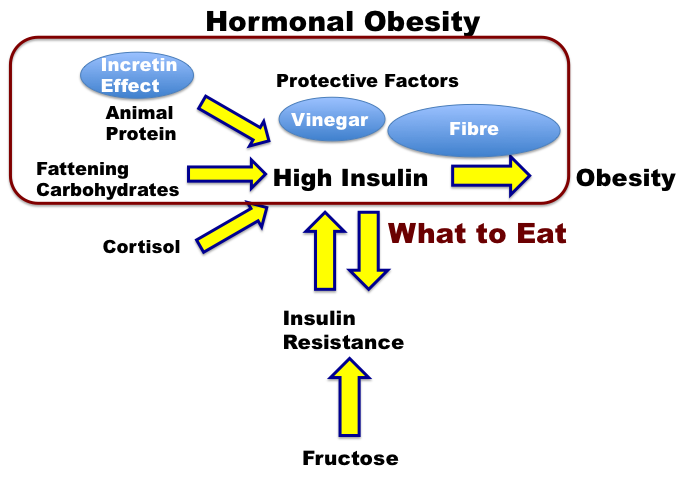 But there is another important contributor to high insulin levels outside of food – insulin resistance. This refers to the situation where normal insulin levels are unable to force the blood glucose into the cells. In response, the body raises insulin in a knee-jerk reaction to ‘overcome’ this resistance, and these high levels will drive obesity. But how did insulin resistance develop in the first place? Our body follows the biologic principle of homeostasis. If exposed to any prolonged stimulus, the body quickly develops resistance. A baby can sleep soundly in a crowded restaurant because the noise is constant, and the baby has become noise ‘resistant’. But that same baby, in a quiet house, will wake instantly at the slightest creak of the floorboards. Since it has been quite, the baby has no ‘resistance’ against noises and thus awakens quickly. If you listen to loud music constantly, you will become slightly deaf. This ‘resistance’ to loud noises protects the ear from damage. Raising the volume to ‘overcome’ this resistance works but only temporarily. Volume increases and you become progressively more deaf (resistant to loud noise), which leads you to raise the volume again. The solution is not to keep raising the volume, but to shut it off. Think about the story of the boy who cries wolf. Raising the alarm constantly may work at first but eventually leads to the villagers becoming resistant to the signal. The more the boy cries, the less effect it has. The solution is to stop crying wolf. Insulin resistance is simply a reaction to too much insulin. The body compensates by raising insulin, but that only makes things worse because higher insulin levels lead to more resistance. This is a vicious cycle. Insulin resistance leads to higher insulin. The end result is higher and higher insulin levels, which then drives weight gain and obesity. Therefore, a high insulin level depends on 2 things. Providing extended periods of low insulin levels can prevent the development of insulin resistance. How to provide those low levels? A daily period of fasting. This may sound strange, but this is the way we used to eat. Suppose you eat breakfast at 8 am and dinner at 6 pm. You eat for 10 hours of the day and fast for 14 hours. This happens every single day, and the reason we use the word ‘break-fast’. This is the meal that breaks our fast implying that fasting is simply a part of everyday life. The body spends roughly equal portions of every day in the fed (insulin high, storing fat) and the fasted state (insulin low, burning fat). Because of this nice balance, weight tends to stay stable over time. Up until the 1980s, this was pretty standard practice and obesity was not a big issue. Somehow, we moved away from this traditional way of eating and now eat constantly. We are hounded to eat something the minute we get out of bed in the morning whether we are hungry or not, believing that eating white bread and jam is better than eating nothing at all. We are pestered to eat throughout the day and not stop until it is time for bed. Large surveys show that most Americans eat 6-10 times per day. Now our body spends the majority of time in the fed state, and we wonder why we can’t lose weight. Eating constantly does not provide the critical period of very low insulin to balance the high insulin periods. Persistently high insulin leads to insulin resistance, which leads only to higher insulin. This is the vicious cycle of weight gain that we must break with fasting. For the boy who cried wolf, which is the better strategy? Stop crying wolf for a month, and then cry loudly once, or cry wolf constantly, but a little more softly? Similarly, to start burning body fat, you must allow prolonged periods of time of low insulin. Don’t eat all the time (time-restricted eating or intermittent fasting). Stop snacking. We often obsess about the foods we should or should not eat, the question of ‘what to eat’. But we often ignore the equally important question of ‘when to eat’. By attacking the insulin problem on both fronts, we have a far higher chance of successfully losing weight. So are you saying to just not snack between breakfast, lunch and dinner? Or are you suggesting skip lunch and just eat breakfast and dinner? I’ve become conditioned to snack between meals but it’s typically things like nuts and sunflower seeds. Do these cause insulin spikes as well? Please read the article once again, this time carefully. Every snack/food raises the insulin levels – some more, some less. Rich, he clearly states multiple “Do not snack”. A quote from the end. 1. Don’t eat all the time (time-restricted eating or intermittent fasting). Stop snacking. They are typically referring to the hepatic glycogen store, which is used to maintain blood sugar levels. It is much smaller, more like 4-500kcal and may be depleted within that time. The glycogen inside muscles does not go back into the blood stream and so is less relevant. the idea is to cram your breakfast lunch and dinner into a small time window, usually 8 hours or less preferably 6 hours or less, I personally eat in a five to six hour window each day and fast the other 18 or 19 hours, and at least once a week I fast for a 24-hour period. Dr. Fung, Please review Dr. Benjamin Bikman’s study/talk regarding the effect of protein intake while fasted, on a ketogenic diet, or on the SAD. His results indicate that protein intake on a ketogenic diet do not affect insulin levels at all, but instead raise glucagon. The reason given is that in an already low blood sugar state, the body cannot afford to interrupt gluconeogenisis. I have a friend who is a Type 1.5 LADA diabetic. Her diabetes has more in common with that of a Type 1 diabetic in that her pancreas no longer produces insulin. This means that she has to test her BG several times a day to inject the correct amount of insulin. She says that protein DEFINITELY raises her BG and creates the need for more insulin. Her goal is to inject the least amount of insulin possible, so it is something she focuses upon. She has been eating low carb/keto for 20 years, long before she was diagnosed. Richard Starr; Personally, although I appreciated all the detail and explanation of the Youtube presentation, I think it only further emphasizes the bottom line type conclusion Dr. Fung has presented. Still, what I enjoyed (!) was this: No, carbs and glucose are not needed for the brain, or if they are, there is still no evidence to support that contention; and the disclaimers as to carbohydrates: Don’t eat bread. Super article. One can do great if they read just this one post and nothing else about weight loss ever again. Dr Fung you are a hero. You have changed my life. I am a new person now. I actually have hope for my future health. I am glad you could find help through this article. I am obese myself and want the way I look. Would you be okay with sharing your story and give me tips? This is a great support group for Dr. Fung’s work. I hope you’ll join us if you haven’t found us already. Clear easy to understand prescription on how to lose weight. Sad that so many people who want to lose weight miss the what and when approach. Excess protein does not cause kidney damage in the already healthy. Dr. Fung sees patients having trouble with their kidneys vis-a-vis protein consumption because their kidneys are already damaged. People with kidney damage also can’t process potassium properly anymore. Are you going to tell healthy people to avoid potassium? You’d be irresponsible if you did. I’ve no use for Rosedale whatsoever. He’s another one of those “safe starch” fanatics. I’d show you a photo of what “safe starches” did to me, but you don’t want to see that. Nobody wants to see that. Couldn’t agree with you more Richard! I’m having a hard time seeing how @Dana’s response equates to trolling. She didn’t even resort to ad hominem insults as you did @Christina. At risk of being accused of trolling myself, I have to ask what your statement that “teeth were designed to eat both flesh and plant material” is based on? We have some teeth that are adapted to tear (incisors) and some adapted to grind (molars), but I’m not sure that equates to the type of food they are “designed” for. Is there a way to get these post by email. The article suggests this post is an installment. Laura, what worked for me is skipping breakfast and eliminating snacks. I have lunch at 12-12.30, and dinner at around 17.30-18.00. No calories intake after that. If it suits your lifestyle more, you can skip dinner too, or skip an entire day of eating, 2-3 times per week. You have to test and see what works for you. Regarding what to eat, I recommend you check dietdoctor.com, it has countless recipes and visual representations of what is too much for each type of food. Dr. Fung, is low testosterone part of metabolic syndrome? In other words, does lower testosterone affect obesity directly or indirectly by contributing to hyperinsulinemia? Yes, aromatase is an enzyme contained in fat that converts testosterone into estrogens essentially lowering testosterone. Metabolic syndrome pts with central obesity can have lower test levels due to the aforementioned bio pathway. Sorry but you’re a kidney specialist with expertise in fasting?.. And didn’t site any articles? Garbage. Read Dr. Fung’s book The Obesity Code. It contains the research that backs up his work. Or watch YouTube videos or read his blog. Blindly accepting the theories of modern medicine just because they “say so” is garbage. Following what the gov’t tells us about our diet and exercise without using our own brains is garbage. Just because people have done something for a long time does not make it right. Rich, your trolling contributes nothing. Would you be happy for me to use this in printed form to give to some of my UK general practice patients? Very digestible info thank you? Amazing post by dr Fung. Thank you dr Fung. Dr. Jung, I’m hoping you notice and have a chance to answer my question. I’ve been following a LCHF diet as well as 16/8 intermittent fasting. My question is, should I be making up for the calories I don’t consume during a fast? Should I be focusing on hitting a caloric goal every week? I know you’ve mentioned many times the myth of calories in/calories out, and that we need to stop obsessing over it. I’m having a hard time with trying to decide how many calories I need to consume daily/weekly, even while on a LCHF diet and fasting daily. Could you please explain this apparent paradox. Can IF cause the body to go into survival mode and prevent it from losing weight to avoid starvation? Is that even true? Okay, so if “carbs” raise insulin and cause obesity, then why aren’t all the crazy vegan/fruitarian zealots on YouTube look emaciated? Also, popular mono diets like the potato-only diet have people dropping over 100 pounds in just three months. How does that work?!? I work 12hour swing shifts 4 nights then off 3 days & then 3 12 hours day shifts Then Off for 36 hours. Then I’m right back on nights for 3 nights. Then off 3 days. Then back on day shift for 4 days. Then I’m off for 6 straight days. Then the cycle repeats itself. This has been going on every month for 6 years. When is the best time for me to fast with this schedule? This is so true for me. Paying attention to hunger levels both before eating and during is the only thing that keeps me on track. The struggle is real. And thirsty is another “maybe I could eat” trigger if you’re not really mindful. I object to “assed.”. Also, the comment on the podcast ” progress not perfection ” is stolen from 12 step programs. It’s not honest to use it. So, you’re dishonest and you use vulgar language in professional discourse. I too, seem to wonder about that magic window ,so to speak. From the time I finish a meal , Is that when the clock begin as far as fasting? Does digestion not come into play here.It seems to me that a fast shouldn’t “technically” start until that process is complete. Also at what point following does the body realize its not in calorie restricted mode and switch burning fat stores?Is there a lag time ?Also curious about eating a meal shortly before going to bed. Does this Contribute to ones obesity as we’ve been told ? is one cookie the same as 10?? all of this is no different than before– find the magic foods and eat as much as you want– help the economy– don’t buy one avocado and eat half– buy three and eat all of them. 24hr fast Should we be taking a break between fasting?. Is it safe to do everyday? I think “it depends” and “listen to your body” are the best answers. I’d start small first. And with longer fasts look into homemade electrolyte replacements like “Snake juice” (seen recommended on a fasting Reddit group…just some salt, no-salt aka KCl, and baking soda in water…maybe a little magnesium sulfate or Epsom salts too).